Cincinnati has a one of the richest German histories in all of America. The German history dates back even to the inception of the city in 1788. German immigrants came to America in large numbers due to a variety of reasons from religious freedom to the availability of mechanized manufacturing of goods. As a result they were attracted to America’s heartland and formed what is now called the “German Triangle.” The triangle was formed by St. Louis, Milwaukee and Cincinnati…with Cincinnati being the largest of those cities and also the city containing the largest German influence. So, who cares? Well what would Cincinnati be like today without the strong German influence of the past? We can attribute that strong influence to the current day butchers, bakeries and ice cream shops that still exist in nearly every neighborhood in the region. Over-the-Rhine was built by those German immigrants and thus the creation of the largest collection of Italianate architecture in America. Cincinnati’s built environment was greatly influenced by those same immigrants. They built a dense urban core with streetcars and all, not to mention they helped build what is considered to be America’s first major boomtown. 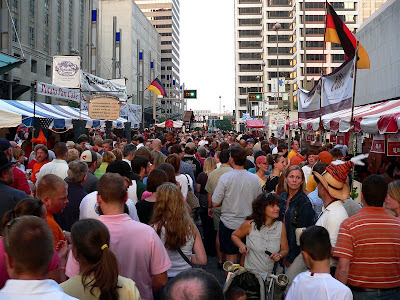 It is also by no mistake that the largest Oktoberfest celebration exists in Cincinnati (outside of the Munich event). We also have the only Hofbrauhaus outside of Munich, Germany. In addition to that Cincinnati boasts the Fairview German Language School and one of the largest German-American book collections at the University of Cincinnati. In addition to that, roughly 50% of all people in the Cincinnati claim German as their ancestry…again, one of the largest percentages in the nation. A few other notable Cincinnati landmarks created or inspired by German immigrants are: Fountain Square, Roebling Suspension Bridge, Cincinnati Zoo, Spring Grove Cemetery, Music Hall, Findlay Market and the Cincinnati Park System. Cincinnati’s German heritage has surely shaped the physical environment of our city, and has also shaped the social environment over the years as well. I just don’t think that Cincinnati would be the family-friendly place it is today without those unique Cincinnati features of being able to go to Humbert’s Meats or Servatii’s pastry shop. What do you think and how does Cincinnati’s heritage affect your day to day life? How would Cincinnati be different without this German influence…or is it even relevant today?